I think they were aming for sisterhood, which could (sort of) be phrased as brotherhood, which comes out as אחוה (or more commonly אחווה, but I think they rendered it אחוה and mistatted the ו). I'm with Shunra. This was no doubt meant to be Achva, and what we actually have here is yet another case of Vav-Resh confusion. 1. Adding a hyphen and the word "אחזיק" would give "אחרה-אחזיק", "I shall join/follow", which would suit their strong sisterly bond. 2. Adding double quotes and a Tsadi would give אחרה"צ - "afternoon". Silly? Maybe, or maybe they consider themselves "dusk-sisters". Maybe from a term in the Kabbalah. 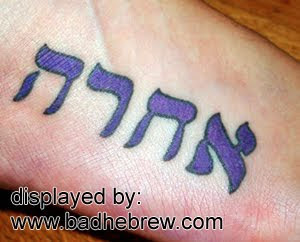 Shunra right it mean "אחווה" or "אחוה"